"HISTORICAL SKINS ADD ON #1" For WINGS: OVER FLANDERS FIELDS v1 and v2, V3 or Ultimate Edition! by artists Arto, James, Mike, Terry. Now free to download and install for all WOFF / WOFF UE users. Note the files and skins all still remain © OBD Software and must not be used elsewhere or reproduced. DOWNLOAD File Size 2.11 GB (2,276,375,509 bytes) FREE DOWNLOAD REQUIRES any version of WOFF. For WOFF users only. You may only use installed within OBD Software's products such as Wings: Over Flanders Fields 1, 2 or 3, or UE, or WOFF's official add-ons . This is an Aircraft Texture pack ("skin" pack) for WINGS: OVER FLANDERS FIELDS. Adds over 4500 historically researched aircraft textures for WOFF with new details and updated research. Adds many squadron aircraft colours, Aces and Historical Pilots' colours to bring the WOFF skies even more alive! You can also choose many of these skins in Quick Combat to use on your specific aircraft chosen, where available. Download file size is approximately 1.5GB. System Requirements: Installation requires Approx 12GB free of hard drive space in the same location as WOFF is installed. Box for illustration only, not supplied. * NOTE: You must DISABLE Microsoft Security Essentials Anti Virus before running the installer to avoid long installation problems. SEE BELOW FOR GENERAL HELP INSTALLING THIS Note NO SUPPORT is offered for this free Skin Add On #1 pack. See the WOFF UE FAQ for all the help offered. (or ask other users in the forum). After install make sure you update your WOFF to the latest update for it if available (even if already applied - this will ensure any later updated skins get fixed/added). Contains the exact same details as on the left, except this is supplied in a Boxed printed DVD, and also has a digital download for convenience. Note this is still only 1 user license. You may use either or both but only for your own use. 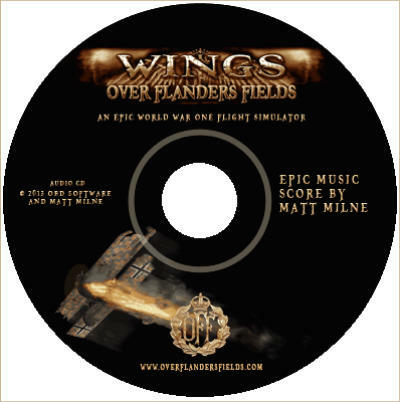 "EXTRA MUSIC TRACKS for WOFF UE"
A Real Immersive Dynamic Campaign for World War one air combat. The New WOFF Manager controls and creates the new campaigns and missions - . : WOFF is geared towards a real-time, fully immersive single player dynamic campaign system, designed to immerse the player in as realistic a world as possible, and to recreate as closely as possible the first world war, in a 'living world' about them! The WOFF interface also manages all aspects of the dynamic campaign and can take full advantage of WOFF AI and many new WW1 features. .: The WOFF manager and whole campaign code is totally written from scratch - specifically for WW1. .: Enlist in an immersive dynamic campaign as a WW1 pilot in one of four Nations; Britain, France, USA or Germany. .: Career dates range from early 1915 through to the completion of the war with up to 55 aircraft types available in the release version with more to come as add-on packs later. See the aircraft section for more details. .: Choose from one of many historical squadrons to enlist in - all available in the main WOFF 1 release version: Britain: 42 Fighter squadrons ; 27 2-Seater Squadrons Germany: 80 Fighter squadrons ; 101 2-Seater Squadrons France: 79 Fighter squadrons ; 24 2-Seater Squadrons USA: 14 Fighter squadrons Many squadron specific skins are included so that you fly with the correct squadron insignia and markings for the chosen squadron. Note: Some squadron aircraft are not currently available but we will be releasing more craft as add-on packs . : When choosing a Squadron you are shown where the squadron is based relative to the front-lines, as well as the Squadron Craft Complement, Ace complement, Morale, Activities etc. so that you can easily launch yourself into a squadron that suits you and your virtual flying needs. Once in a squadron you can also use the Intelligence room check what the surrounding squadrons (enemy and friend) are. Or you can auto-enlist and be assigned automatically to a squadron, electing optionally to undergo training at a home field first. .: Fully interactive Pilot log books keep track of up to 100 virtual pilots that you may enlist at any given time. The Log Book reflects Pilot Biography, user selected Photograph and accurately tracks the flyers Flights and Hours, Claims and Victories, Awards, and General Squadron Details such as location, craft upgrades, transfers etc. .: Complete your training with your trainer at a historically accurate location to get the required flying hours and move on to the action in your chosen squad, or just join the fray as an experienced Flyer. .: Fly and survive - file claims for your kills (optional configuration settings allows kills to be awarded immediately) and climb the ranks and receive aircraft upgrades over time as the squadron historically did. Your missions are largely tailored to the historical mission types that the squadron flew during WW1. .: Lead your flight or be lead - depending on your rank (or optionally you can always lead your flight) as a leader you can control your flight with key commands and lead them to destiny. .: With over 1000 targets of opportunity for any of the 12 front-line states (see scenery for more details) - fly and defend your nation in one of histories most bloody wars. (In effect over 12000 targets for the war) . : Mixed flight complements: Fly with the Aces (many with their correct historically accurate skins and assigned to their historical squadron machines), and also fly in multiple mixed aircraft type flights! . : Select your own personal skin (Players may create additional personal skins in their favourite paint program and use them). .: Equip your flight and your personal aircraft load outs, from flight loads to individual pilot loads in your flight. .: File requests for a Transfer to another squadron at any time. This may or may not be approved depending on your rating and the rating of the squadron you have requested to transfer to - it also takes time for approval. (Or select the configuration setting option for instantaneous transfer - no approval required and you transfer immediately!) . : Squad dynamics change constantly over time with painstakingly accurate and detailed data research, for each and every squadron, to reflect the changing Craft Allocations, Airfield Locations, Ace Complements, Morale, Skill, Material and Manpower Issues, Current Role (defines squadron's historically accurate activities at that moment in time) and Frequency of Operations, to name a few. .: Fly in a dynamic world with no artificial 'air spawns' - up to 250 aircraft are dynamically assigned to fly from real squadron bases on real squadron operations based on the squadrons historical detail data for that moment in time. If you deviate from your flight path beware: there is a war on, and you will run into these squads and ground units - for good or bad - together with active ground units. Flights are sometimes waiting on the ground at fields to takeoff or are 'scrambled for takeoff and interception, based on in-coming AI craft approach or the players approach - a true 'living world'. .: Protect your men and material - excessive losses can eventually lead to your squadron becoming grounded whilst you wait for your replacement pilots, aircraft or repairs. .: Visit the stores room to evaluate aircraft stock and aircraft repairs status . : Visit the 'Intelligence' room to get the latest on the war or evaluate nearby enemy squadrons that you are likely to encounter over the front lines! It is here that you can apply for Transfers as you evaluate possible squadrons to transfer to. .: Ground activity reflects the major battles as and when they raged along the front-lines for the duration of the war. .: A master 'Order of Battle' system controls the air and ground activity in each of 4 sectors - Flanders, Marne, Verdun and Alsace to reflect the dynamics of the air and ground war. .: Accurate tracking of all player squadron pilots, including the players A and B flight members, in runtime, for accurate post mission results and tallies. Each of the AI pilots in your squad have logbooks which you can peruse to evaluate their progression strengths, weaknesses, claims and kills, and even view their medals. .: Dynamically moving front lines modelled in 12 states follow the historical battle actions of the western front as accurately as possible from 1915 to 1918. .: Many historical Landmarks that become permanently damaged when they did historically. .: Fly with either dynamically changing weather or historically accurate weather - bad weather will see all air ops grounded. Other features include windscreens that are affected by weather (frosty, rainy, etc.). . : Pre Flight briefing interface shows details of the intended operation, way-points, and target on an interactive map so that you are fully aware of what you have to do. and more including Terror Over England Campaign - defend England from Gotha and Zeppelin raids, or fly for Axis and fly the giant Gotha bombers against England. NEW ADDITIONAL FEATURES IN WOFF ULTIMATE EDITION! These are in addition to the incorporation of all previous WOFF releases and features: 1) Two new 2-seater aircraft Breguet 14 A.2 and the Caudron G.4. Both important French craft 2) New 3D Direct X Shaders for superb visuals in sim, with improved FPS, especially at airfields and self shadowing and more: - much improved rendering of shadows on aircraft and objects. Also now shadows will now remain visible from parts that are no longer in view. - new feature: dynamic ground shadows, fully replacing stock shadows with new much improved and faster shader versions. New performance from WOFF core engine too, combined with the new shaders and other optimisations gives a dramatic increase in FPS. This alone is a major point! 3) Fully revised French squadrons to bring the French campaigns in the Champagne regions of Marne and Verdun to life as never before. Extra French airfields in Marne, Verdun and Alsace sectors 4) Now Wide-screen compatible - 3440 x 1440 etc to allow users to take full advantage of the new ultra wide-screen monitors hitting the market. 5) Revised DM for all aircraft (Cockpit damage revised, aircraft will show damage more often, with more varied break ups, other miscellaneous improvements). 6) Implemented bomb load-out options and a detailed bomb rack model for the Roland aircraft. 7) Improved aircraft type deployment at Airfields by Nation: Bombers, Fighters and Specific fields. 8) Improved airfield facility scaling over the years as well as changing tree types depending on location of airfield 9) Revised and improved lighting systems at airfields eg hangar lights etc All lights now work irrespective of craft taking off, or not, at that field. Come home to lights on at your field at late dusk, night or early morning! 10) Added smoke and lights to factory facilities. 11) Added 11 detailed 'Specific Airfields' rendered as closely as possible as they historically were. These fields are fully rendered for all season types : German Roucourt Boistrancourt Phalempin Cappy British Droglandt St Omer and St Omer Extension Mont St Eloi Vert Galant East and West Fields French Behonne Vadelaincourt Lemmes Additional airfields are in the pipeline for future expansions. Note some airfields are period dependant. i.e they only appear in certain time periods of the war. 12) New Winter Trees now bring leafless deciduous trees to the Winter, Winter Light, Winter Medium, and Winter Full Snow, terrain sets, as well as at airfield Facilities for more natural realistic looking airfields. 13) Improved Fine detailed distant object rendering in game. 14) Additional Building models for Airfield Facilities. 15) Earlier operation start times should realise more dawn Patrols, when you can see the dawn and camp lighting for immersive moments, feel the dawn of a new day! 16) Additional British UK airfields and types. 17) Ability to suppress/turn off precipitation effects (rain and snow) in workshops. (Flights are still cancelled on inclement days and weather is still fully variable, there is simply no rain or snow effects in flight). 18) Airfield bumpiness now changes with weather and season conditions 19) Craft wheel rolling sounds now change with weather and season conditions 20) Ability to allow 3rd party mission editors to modify the campaign mission just prior to runtime. 21) Improved dynamic ground bumps on fields. 22) Improved airfield night time Drum lamps. 23) Includes new RNAS squads for Caudrons. 24) Revised Damage rules to lessen craft instant destruction. 25) Updated graphical content for user interface. 26) Revised Flak effect. ------------------------------ . : Immersion Labelling system, including DOTS option, Activity and Identity options for immersion. .: TrackIR - smooth fast implementation. .: Prop Blur - see the Prop from the Cockpit now. .: Flight Training instructor, with flight instructor messages for key events. .: Random aircraft Engine Failures ! . : Wind and 'air bumps'. .: "GAI" flights - these will be waiting on ground to get the call to intercept you . : Gun Jams and Un-jamming. ... and much more you will discover when you fly with Wings: Over Flanders Fields UE. Remember if you did not buy WOFF2 or WOFF3 or some of the Add-on packs, then you are getting the aircraft and features from those packages included! 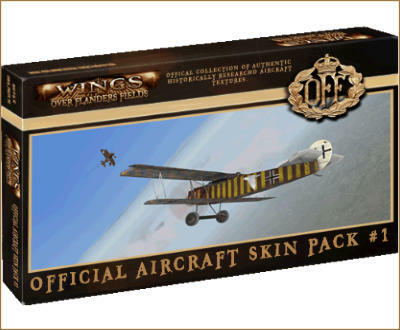 "HISTORICAL SKINS ADD ON #1" For WINGS: OVER FLANDERS FIELDS v1 and v2, V3 or Ultimate Edition! by artists Arto, James, Mike, Terry. Now free to download and install for all WOFF / WOFF ULTIMATE EDITION users. Note the files and skins all still remain © OBD Software and must not be used elsewhere or reproduced. DOWNLOAD (disabled. Please Use the Full site to download) File Size 2.11 GB (2,276,375,509 bytes) FREE DOWNLOAD REQUIRES any version of WOFF. For WOFF users only. You may only use installed within OBD Software's products such as Wings: Over Flanders Fields 1, 2 or 3, or UE, or WOFF's official add-ons . 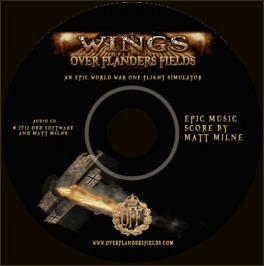 This is an Aircraft Texture pack ("skin" pack) for WINGS: OVER FLANDERS FIELDS. Adds over 4500 historically researched aircraft textures for WOFF with new details and updated research. Adds many squadron aircraft colours, Aces and Historical Pilots' colours to bring the WOFF skies even more alive! You can also choose many of these skins in Quick Combat to use on your specific aircraft chosen, where available. Download file size is approximately 1.5GB. System Requirements: Installation requires Approx 12GB free of hard drive space in the same location as WOFF is installed. Box for illustration only, not supplied. * NOTE: You must DISABLE Microsoft Security Essentials Anti Virus before running the installer to avoid long installation problems. NO SUPPORT is offered for this free Skin Add On #1 pack. After install make sure you update your WOFF to the latest update for it if available (even if already applied - this will ensure any later updated skins get fixed/added). NEW ADDITIONAL FEATURES IN WOFF ULTIMATE EDITION! (Note these features are new and in addition to the incorporated WOFF1,2,3 and all Addons!) 1) Two new 2-seater aircraft Breguet 14 A.2 and the Caudron G.4. Both important French craft 2) New 3D Direct X Shaders for superb visuals in sim, with improved FPS, especially at airfields and self shadowing and more: - much improved rendering of shadows on aircraft and objects. Also now shadows will now remain visible from parts that are no longer in view. - new feature: dynamic ground shadows, fully replacing stock shadows with new much improved and faster shader versions. New performance from WOFF core engine too, combined with the new shaders and other optimisations gives a dramatic increase in FPS. This alone is a major point! 3) Fully revised French squadrons to bring the French campaigns in the Champagne regions of Marne and Verdun to life as never before. Extra French airfields in Marne, Verdun and Alsace sectors 4) Now Wide-screen compatible - 3440 x 1440 etc to allow users to take full advantage of the new ultra wide-screen monitors hitting the market. 5) Revised DM for all aircraft (Cockpit damage revised, aircraft will show damage more often, with more varied break ups, other miscellaneous improvements). 6) Implemented bomb load-out options and a detailed bomb rack model for the Roland aircraft. 7) Improved aircraft type deployment at Airfields by Nation: Bombers, Fighters and Specific fields. 8) Improved airfield facility scaling over the years as well as changing tree types depending on location of airfield 9) Revised and improved lighting systems at airfields eg hangar lights etc All lights now work irrespective of craft taking off, or not, at that field. Come home to lights on at your field at late dusk, night or early morning! 10) Added smoke and lights to factory facilities. 11) Added 11 detailed 'Specific Airfields' rendered as closely as possible as they historically were. These fields are fully rendered for all season types : German Roucourt Boistrancourt Phalempin Cappy British Droglandt, St Omer and St Omer Extension Mont St Eloi, Vert Galant East and West Fields French Behonne, Vadelaincourt, Lemmes Additional airfields are in the pipeline for future expansions. Note some airfields are period dependant. i.e they only appear in certain time periods of the war. 12) New Winter Trees now bring leafless deciduous trees to the Winter, Winter Light, Winter Medium, and Winter Full Snow, terrain sets, as well as at airfield Facilities for more natural realistic looking airfields. 13) Improved Fine detailed distant object rendering in game. 14) Additional Building models for Airfield Facilities. 15) Earlier operation start times should realise more dawn Patrols, when you can see the dawn and camp lighting for immersive moments, feel the dawn of a new day! 16) Additional British UK airfields and types. 17) Ability to suppress/turn off precipitation effects (rain and snow) in workshops. (Flights are still cancelled on inclement days and weather is still fully variable, there is simply no rain or snow effects in flight). 18) Airfield bumpiness now changes with weather and season conditions 19) Craft wheel rolling sounds now change with weather and season conditions 20) Ability to allow 3rd party mission editors to modify the campaign mission just prior to runtime. 21) Improved dynamic ground bumps on fields. 22) Improved airfield night time Drum lamps. 23) Includes new RNAS squads for Caudrons. 24) Revised Damage rules to lessen craft instant destruction. 25) Updated graphical content for user interface. 26) Revised Flak effect. ------------------------------ . : Immersion Labelling system, including DOTS option, Activity and Identity options for immersion. .: TrackIR - smooth fast implementation. .: Prop Blur - see the Prop from the Cockpit now. .: Flight Training instructor, with flight instructor messages for key events. .: Random aircraft Engine Failures ! . : Wind and 'air bumps'. .: "GAI" flights - these will be waiting on ground to get the call to intercept you . : Gun Jams and Un-jamming. ... and much more you will discover when you fly with Wings: Over Flanders Fields UE. Remember if you did not buy WOFF2 or WOFF3 or some of the Add-on packs, then you are getting the aircraft and features from those packages included!